In 2011, a group of industry experts got together to develop a cloud-based solution that would give businesses all the components required to create and manage highly engaging video networks for TV, web and mobile screens. a rich library of premium content across multiple categories. Seven years later, Wovenmedia powers video networks for many household brands from GM to Target, reaching over 120 million monthly viewers in the US and Canada. The company is a first-time sponsor of next week’s 16:9 Mixer at DSE. 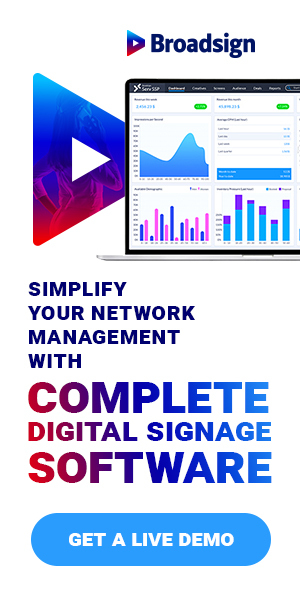 Traditional digital signage only allows you to be seen in place-based environments; with Wovenmedia, your network goes everywhere! With our patented content delivery platform, you can push content to digital signage media players, and simultaneously stream video content online to your website, smartphones and beyond. Supported by close to 150 premium content partners including all the major US broadcasters, we curate and add hours of new sports, entertainment, health, music and television segments to our library every week. We’ve got the content to capture your audience’s attention and delivery a highly engaging experience. The Wovenmedia team is looking forward to DSE as it highlights the best our industry has to offer! We look forward to reconnecting with our partners and creating new industry relationships.